A fundraising celebration to make millions and show support to El CENTRO de Igualdad y Derechos for the faith, fight and the ongoing effort in defending our neighbors, our friends and our community. El CENTRO is a grassroots, immigrants’ rights and workers’ justice organization based in Central New Mexico that works with Latino immigrant communities and allies to defend, strengthen, and advance the rights of our community. ALLL-ready! Variety show from 2-6:30pm filled with fantastical local celebrities such as Sina Soul Queen & The Sound, Blesinfinite, Dre Z, VettaLuv, Wae Fonkey, Circulo Solaris, Capoeira Girassol, Ashley "Saywut" Moyer, Zack Freeman and Robb Janov! Una celebración de recaudación de fondos para ganar millones y mostrar apoyo a El CENTRO de Igualdad y Derechos por la fe, la lucha y el esfuerzo constante en la defensa de nuestros vecinos, nuestros amigos y nuestra comunidad. El CENTRO es una organización de base, de derechos de los inmigrantes y de justicia de los trabajadores, ubicada en el Área Central de Nuevo México, la cual trabaja con comunidades inmigrantes Latinas y aliados para defender, fortalecer y avanzar los derechos de la comunidad. ¡Listos! Talleres colaborativos de 12 a 2 hs. Show de variedades de 2 a 6:30 p.m lleno de celebridades locales como Sina Soul Queen y The Sound, Blesinfinite, Dre Z, VettaLuv, Wae Fonkey, Circulo Solaris, Capoeira GIrassol, Ashley "Saywut" Moyer, Zack Freeman y Robb Janov! Senior 65+ and kids under 10 get in FREE!!! 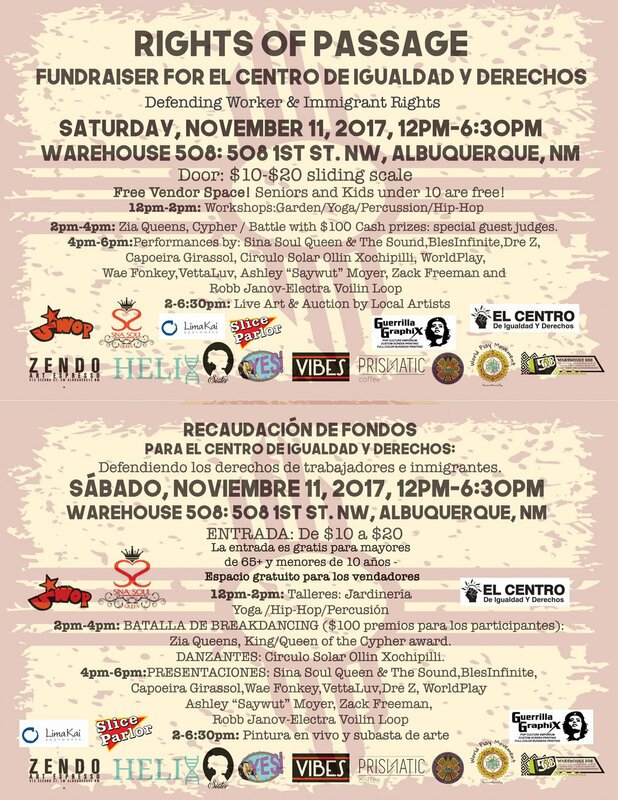 Guerrilla Graphix is proud to support the Rights of Passage fundraiser for El Centro de Igualdad y Derechos, If you'd like more info to know how to get involved or support feel free to contact us at the basecamp office! We just wanted to take a moment to thanks all the of the great customer, client and community support for our continued success!! We've had a great, albeit very hectic year so far and have started to expand our outreach and services due to that success. We have many things in the works at the moment getting ready for 2018 and beyond. !! HAPPY HALLOWEEN NEW MEXICO !!
" keep it strange out there "
Here at Guerrilla Graphix we love the opportunity to partner up with local business to show support for a great cause, we have worked closely with Brittny on projects previously but this one was special so we thought we could help raise awareness to her cause thru our social media outreach. If you'd like to show your support for Elijah check the link below!! TEAM ELIJAH FOR THE WIN !! Hello everybody, My name is Brittny and my little brother is diagnosed with a disease called Duchennes which is a form of muscular dystrophy. For those of you who don't know what that is, it is a genetic mutation of a gene that causes all of your muscles to eventually stop working. Our whole body is made up of muscles, we need them to walk, to talk, to eat, and to breathe. My little brother is 15 years old and by this age it was expected that he'd be in a wheelchair by now but he is beating the odds! He is still walking on his own with the help of leg braces. He gets tired fairly quickly and his muscles ache constantly. All things considered, he's doing well and we're so grateful! The Muscular Dystrophy Association does so much for us, they take care of medical expenses, like his leg braces, they are constantly researching ways to improve the lives of people with MD, and they put on a camp every year for the kids! This all would not be possible without donations. Every year there is a Muscle Walk held to raise money for MDA and we have a team called Team Elijah. Team Elijah will be raising money up until the end of October and we are working hard to reach our goal this year. Any and all donations are greatly appreciated! One of Guerrilla Graphix's co-founders and graphic designers Ramona Teo has an amazing project in the works called the "Jade Oracle Deck" !! 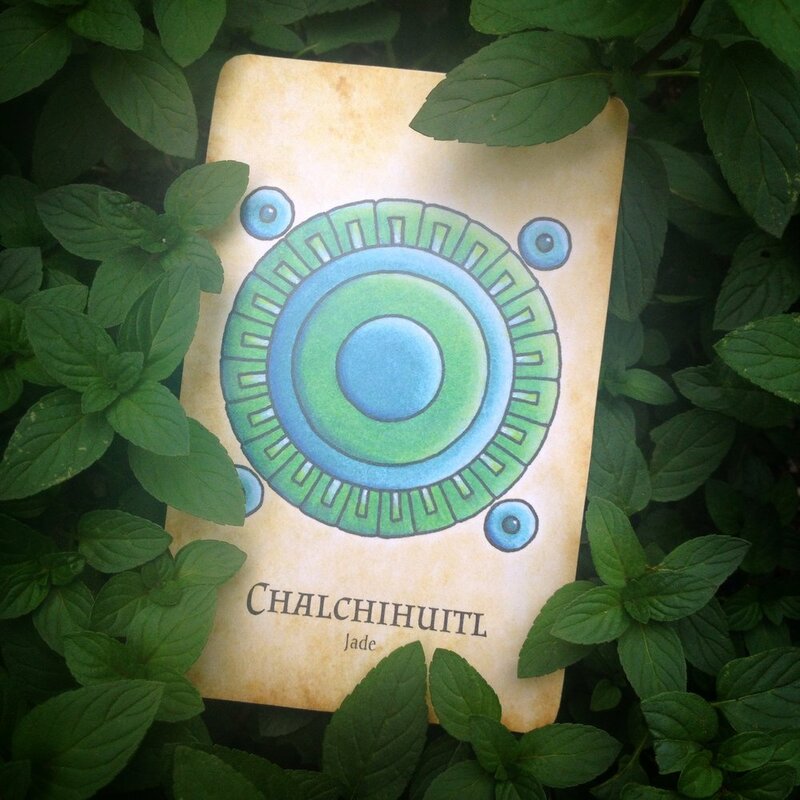 While her and her talents are sadly missed se at GG we love to see our friends and coworkers move on to other projects, if you're not familiar please check out some of her amazing design and illustration work in the Jade Oracle Deck. "What is an oracle deck?" you may be wondering. Like tarot cards, an oracle deck is essentially a spiritual tool used for divination and introspection. The difference is it is not structured by traditional tarot suits and hierarchies. Instead, these cards are an assortment of archetypal symbols and deities from Ancient Mexico. There are 52 beautifully illustrated cards accompanied by a booklet that guides you through understanding the mythology and interpretations of the cards. "The Jade Oracle" is a three-woman collaboration -- Anne Key, Veronica Iglesias and Ramona Teo. Anne is a priestess, a scholar, an author, and a dancer. Veronica is a healer from Mexico City, a Keeper of the Ancient Knowledge, a historian, and a spiritual guide. Ramona is a visionary artist, graphic designer, co-counder of Guerrilla Graphix, and the illustrator of the deck. We have decided that the best way to bring these cards into being is to "crowdfund" the money we need for production. We are running a Kickstarter Campaign for The Jade Oracle! Kickstarter, like other crowdfunding platforms, is a way for artists, inventors & entrepreneurs to raise money needed to manifest their projects. Thousands of amazing creative ideas have been made real through crowdfunding. How it works is simple. Supporters donate money toward the campaign on the Kickstarter website, and in exchange they receive cool rewards from the project creators. It doesn't take long for many small donations to add up and successfully fund the project. In addition to our original rewards (stickers, greeting cards, art prints, Jade Oracle Decks and readings) we have added several new reward options, including... The Jade Oracle COLORING BOOK! Additionally, you can now receive a custom illustration by Ramona Teo, price breaks on multiple Jade Oracle decks, and for all of you adventurers... a guided tour through the sacred sites of Mexico! Your pledge is your vote for our success in completing this project. 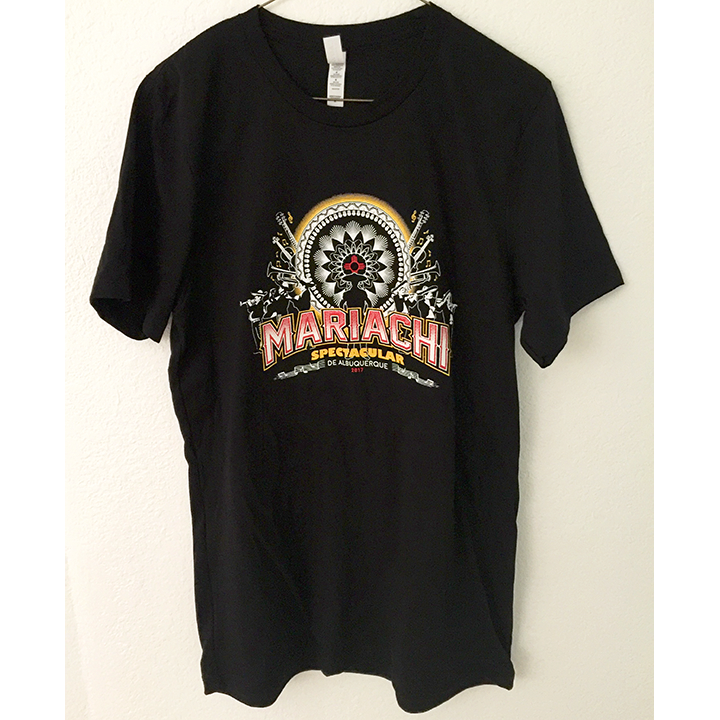 Visit Kickstarter and join our backer community. Then spread the word to your friends! Do you have an email list? A blog? A website? A YouTube channel? A social media platform you use to share with your community? Give us a shout-out! Thanks so much for following along as this creative adventure unfolds. !! THANKS FOR THE LOVE AND SUPPORT ! !